[Oestreicher, Mark] Redefining ourselves. We know the song-and-dance of attractional youth ministry didn’t really work, but most youth workers (and certainly the collective voice and thought) don’t know where to turn instead. So we’re starting to talk a new talk, but we’re still using the same ol’ bag o’ tricks. 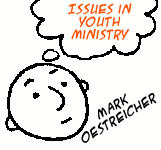 [Oestreicher, Mark] Same thing we’ve always responded to effectively – namely, connecting with real kids in their world; being there; the ministry of presence. This hasn’t changed. Youth workers with a heart for teenagers (not a heart for programming or speaking or bigness) will continue to have an impact no matter what their thinking or theology or programming. [Oestreicher, Mark] We need to go deeper, helping student experience and internalize a real and tangible and thoughtful faith that isn’t built on fun youth group times; and we need to help students translate faith into real life serving and loving of the whole world. Mark Oestreicher is the President of Youth Specialties. Visit his blog at www.ysmarko.com.